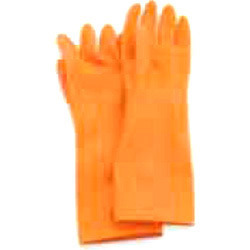 Our range of products include cryogenic gloves, kevlar arm sleeves, pvc gloves, nitrile coated gloves, nitrile glove and pu coated nylon gloves. 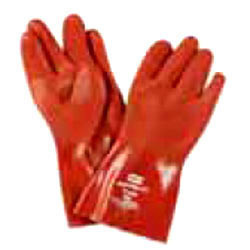 We are offering a wide variety of Cryogenic Gloves that is available in different material. 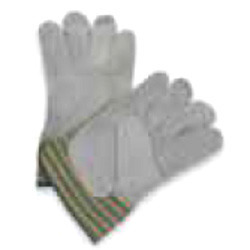 These gloves are extensively used to in the manufacturing sectors, that involve contact with harmful substances or warm products. Known for their durability and high performance, these are available in various sizes. 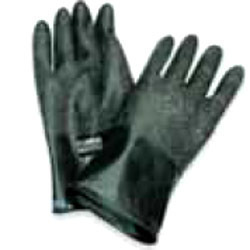 Product Use: Protection against small drops of liquid gas up to - 170°C. The US assembly, the winged thumb and flexibility of the materials used make this glove anatomical, thus providing excellent comfort. The Velcro fastening tab gives the glove good support. The silicone cowhide grain leather ensures good flexibility, even at a low temperature as well as water repellence and good mechanical protection. Its polar double insulation offers outstanding protection against the cold and rays. The reinforcement between the thumb and index finger increases the glove's mechanical resistance and durability by strengthening the areas of wear. 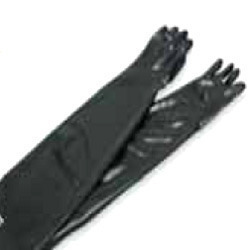 PVC Gloves offeredcome in quality construction finish and can be made available in choice of different finish sizes as well as construction options to choose from. We can make these gloves available in choice of different colors for high visibility as well as in rough finish for better grip support. 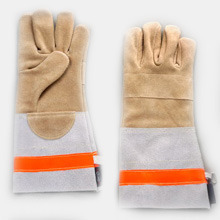 Some of its features include liner support for quick absorption of perspiration; flexible and liquid resistant finish; available with knit wrist gauntlet; suitable for use in areas like construction, petrochemical plants, chemical handling and others. 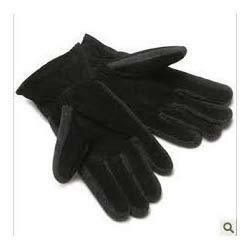 With through knowledge of the industry, we are engaged in distributing quality range of General Purpose Glove. 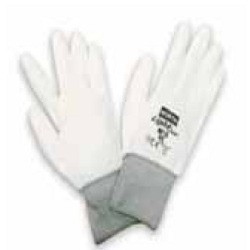 These gloves are made under the strict supervision of experienced professionals at the sophisticated manufacturing unit of our vendors. 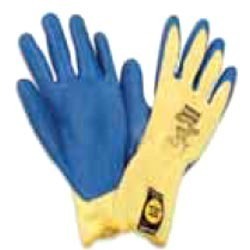 Offered products are widely used to provide protection from dirt and mechanical hazards (such as sharp or abrasive objects) or to enhance the wearer’s grip. Further, we also offer all these doors in custom-built range and at reasonable market prices. 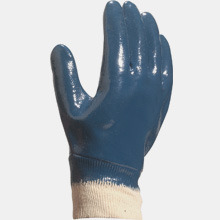 Nitrile Coated on Nylon Gloves for Material Handling. 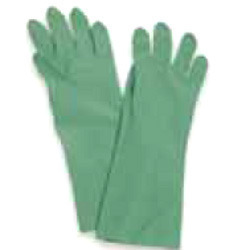 Nitrile can be used for both supported and un-supported gloves. It offers excellent protection against acids, bases, oils, solvents, esters, grease and animal fats. 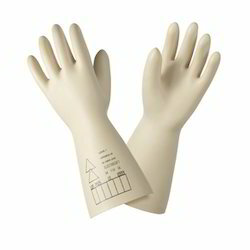 Nitrile is more resistant to snags, punctures, abrasions and cuts than neoprene or PVC gloves, and unlike natural rubber gloves, contains no natural rubber proteins which can cause allergic reactions. 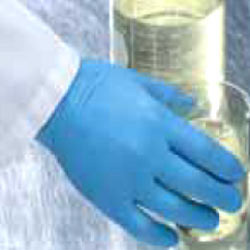 Because nitrile gloves are so versatile, they are ideal for use in many applications, including laboratories, automotive and aircraft part-handling and assembly, plant cleaning,chemical processing, food processing, petroleum refining, dip tank operations, acid etching,painting, graphic arts, battery manufacturing, degreasing, electronics and pesticide handling. Mechanical protection with maximum dexterity. Are made by dipping a hand form (usually made of porcelain) directly into a tank containing a polymer in liquid form. After drying, curing, stripping and washing, the glove produced is basically a layer or film of polymer with no supporting structure (an unsupported glove). 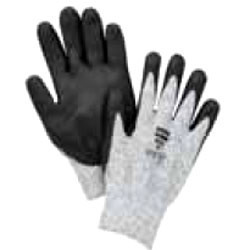 To increase comfort, cotton flocking can be added to the interior of unsupported gloves. Flocking absorbs perspiration and aids in donning and doffing. 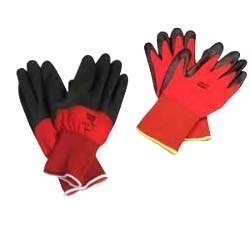 Unsupported gloves are more economical than supported gloves, but may not last as long and will not provide as much protection against abrasions, cuts, punctures and snags. Applications : Glass Handling. Sheet Metal Handling. 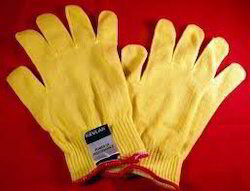 Kevlar gloves are cut resistant, lightweight, and are fantastic for dealing with spiny plants or anything with a sharp edge. 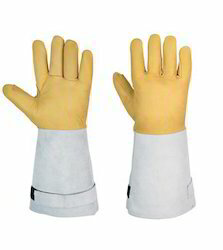 Made of 100% Kevlar, yellow color, they are the same on both sides so will fit either hand. Sold individually. Can resist upto 150 to 400 degree celcius. 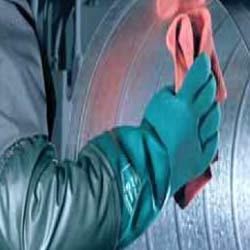 Butyl glove is a man-made rubber that exhibits the highest permeation resistance to gas or water vapor of any glove polymer available today. It has many applications in industry, and is also the glove of choice for military, disaster preparedness and hazmat applications the world over. It is ideal for use in ketones (MEK, MIBK, acetone), esters (tricresyl phosphate,amyl acetate, ethyl acetate) and highly corrosive acids. 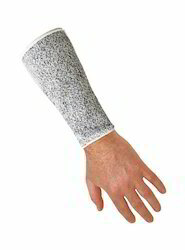 Dyneema Glove was developed by DSM as a multipurpose high performance polyethylene fiber. It has excellent abrasion and cut resistance, being up to 15 times stronger than steel (weight for weight). It is cool to the touch and comfortable to wear and also launders well. 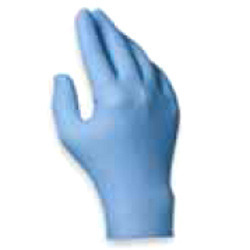 On the offering from our organization is an effective range of Disposables Glove. All these products are manufactured in accordance with the norms and standards already laid by the industry. A team of deft experts monitor every stage of production, in order to maintain quality standard of the product. We offer these products in different sizes, with an aim to meet the diversified requirement of the customers. Offered range of products provide limited protection against liquids, oils, chemicals and mechanical hazards, but are an excellent choice for contamination protection. These products are highly appreciated and demanded by the client across the region. All these are usually discarded after a single use. 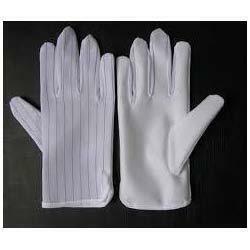 With through knowledge of the industry, we are instrumental in distributing premium quality Cut Resistant Glove. Offered products are sourced from the reputed vendors of the market, who use modern machines and high-grade material such as Kevlar®, Dyneema® and stainless steel mesh, in the manufacturing process. These products designed by the experts in order to provide protection against sharp objects such as blades, glass and metals. We also offer these products in custom-built range as per the requirement of the patrons and at reasonable market prices. 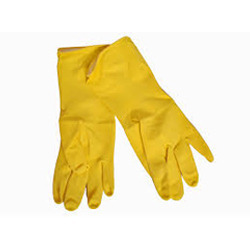 Natural rubber is widely used for gloves because it is relatively inexpensive, and yet offers good resistance to certain groups of chemicals (such as acids). 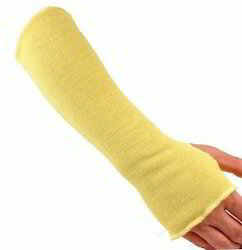 It also has good resistance to abrasion, cuts, tears and punctures. It’s also very comfortable and permits excellent dexterity. Natural rubber can be an economical alternative to nitrile or neoprene. A negative aspect of natural rubber is that it contains proteins that can cause allergic reactions, so it is not recommended for everyone. Natural rubber also will swell and degrade in contact with various animal fats, oils and solvents. Neoprene offers protection from acids, alcohols, oils, solvents, esters, grease and animal fats. It has been largely eclipsed by nitrile, but still has a niche in certain industries, notably the petrochemical industry. 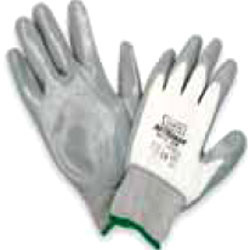 PVC provides resistance to most fats, oils, acids, caustics and petroleum hydrocarbons, but PVC gloves are mostly sold as general purpose gloves,intended for numerous applications involving incidental exposure to a variety of low level chemical hazards. 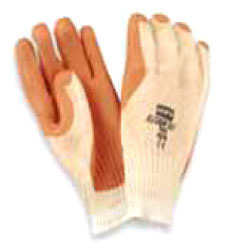 They are mostly supported gloves (dipped on a liner) which means that the PVC layer is of variable thickness, which it turn means that the glove’s chemical resistance varies from one part of the glove to another. 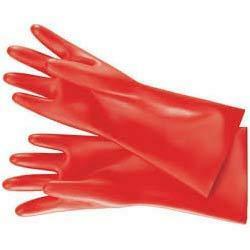 PVC is a very versatile and inexpensive polymer and supported PVC gloves are available in a wide range of styles, finishes and colors. They have applications in many industries, including petrochemical,construction, fishing industry, cold storage etc. Its thickness (2.3mm) provides good dexterity while offering protection up to 17,000 volts. Looking for Hand Protection ?